Essential safety equipment for scuba diving, sailing and many other watersports. 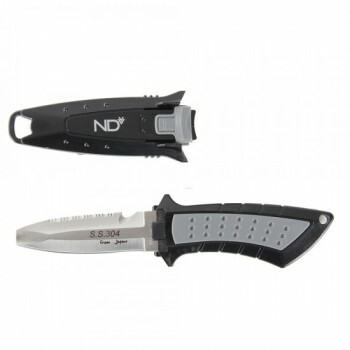 This ultra compact BCD/PFD dive knife set features a 70mm, 304 grade Stainless Steel, twin edged, heavy-duty, chisel point knife blade (for additional safety, when stowing the knife in its sheath). 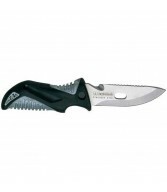 The twin edged 70mm Stainless Steel blade features a sharp edge, a serrated edge and a handy line cutter. 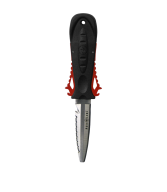 Unlike other small diving knives and BCD knives, for reliability, the blade on our Deluxe Stainless Steel Rescue Knife is manufactured from ultra high spec, 2.5mm, 304 grade Stainless Steel. Supplied complete with a compact ‘hard’ knife sheath, in plain black or ultra high-vis scuba yellow, featuring a unique 'thumb-lock’ (quick release) knife security system and incorporating multi-point attachment options, with an eye-hole anchor point at the base and including an extra BCD hose/rope attachment bracket. The included ‘hard case’ knife sheath incorporates a webbing belt clip on the rear, for specialist rescue attachment or for attaching to any nylon harness webbing. Also includes a specific BCD hose or safety rope attachment bracket, which can be simply exchanged with the rear 'belt mount' bracket, when required. This knife also features an ergonomic ‘comfort’ knife handle, also incorporating an eye-hole anchor point, for attaching a bungee or similar style security device.